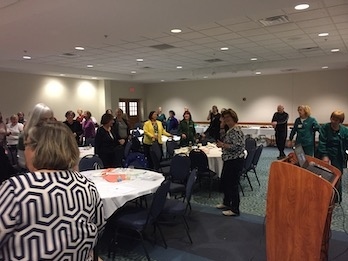 The Capital Area Community Nursing Network intentionally addresses nursing practice and community needs in the Capital Area through communication, collaboration and advocacy to build action alliances. On March 19, 2019, CACNN’s Millennial Speaker Bureau launched its first panel presentation. 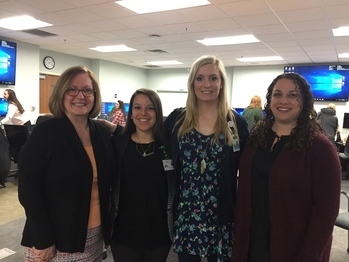 Angela Ackley*, MSN, RN; Ashley Benjamin**, RN and Antigoni Tzumakas***, BSN, RN provided a 60-minute presentation featuring their role and professional sites in rural health, long term care, and community case management practice. More than eighty nursing students preparing to graduate in May 2019 from Michigan State University’s Baccalaureate Nursing (BSN) program attended. Following the presentation, the students, enrolled in NUR 460, Leadership in Clinical Practice, engaged in a question and answer period to learn about hiring, benefits of staffing at these practice sites, tuition forgiveness, and the supports established for new practitioners. The Millennial Speaker Bureau is an outcome of the CACNN "Readiness for Practice" initiative with the goal to provide an example of alternatives to acute care practice attractive to young nurses. The speaker panel is comprised of Millennial-aged nurses in a variety of practice settings. Speaking engagements are currently being scheduled. Please contact CAHA at connect@cahealthalliance.org if you are interested in this group. *Angela Ackley, MSN, RN is the Manager of the Emergency Department at Eaton Rapids Medical Center, a rural community hospital in Eaton Rapids, MI. **Ashley Benjamin, RN is the Assistant Director of Nursing and Staff Development Coordinator at Holt Senior Care and Rehabilitation Center in Holt, MI. ***Antigoni Tzumakas, BSN, RN is a Nurse Case Manager providing community services to elderly individuals through the Tri-County Office on Aging. May 10, 2017, Hannah Community Center (819 Abbot Rd., East Lansing, MI). Guest speaker Roxane Chan PhD, RN, AHN-BCspoke on Care Giver Strategies for Chronic Pain Management. May 12, 2016, Hannah Community Center (819 Abbot Rd., East Lansing, MI). Guest speaker Leslie E. Simons, DNP, ANP-BC, Assistant Professor, Health Programs in the College of Nursing at Michigan State University spoke on Pain Management in Elders with Chronic Nonmalignant Pain. May 12, 2015, Hannah Community Center (819 Abbot Rd., East Lansing, MI). 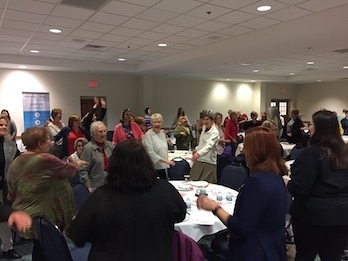 The annual region-wide celebration was open to the public and offered a continuing education program, networking, dinner and recognition of the work of nurses in the Capital Area. May 7, 2014, Hannah Community Center (819 Abbot Rd., East Lansing, MI). 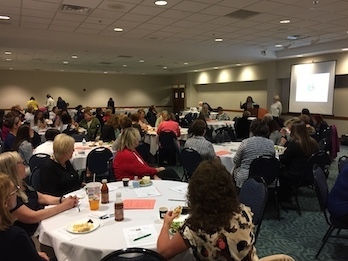 The annual celebration drew 110 participants who attended a Pain Management workshop and obtained Continuing Education credits and enjoyed an evening of networking, refreshments, and prizes, in recognition of the contributions that nurses and nursing make to our community. December 12, 2012. PowerPoint Presentations are available for viewing here.